What is Leaded Stained Glass? Leaded stained glass is the form traditionally used in old houses and churches in the UK. The lead came (channel) is H shaped in cross section; you cut your glass to slot into the top and bottom parts of the lead and solder the junctions in the lead came to fix everything in place. If you’ve never cut glass before, don’t worry; we’ll start by getting you cutting with confidence before teaching you to create your own design firstly on paper and then in glass. In two days a beginner can expect to make a panel of around A4 size with ten pieces; if you have prior experience, you’ll probably have time to do something more complex. We encourage clients to use slim and elegant lead to make a panel that you’ll be proud to show to your friends. (We can provide wider lead if you prefer.) While it’s quicker to do something just with straight lines and with wide lead, we like to take the time to teach you good techniques for a nicer end result. 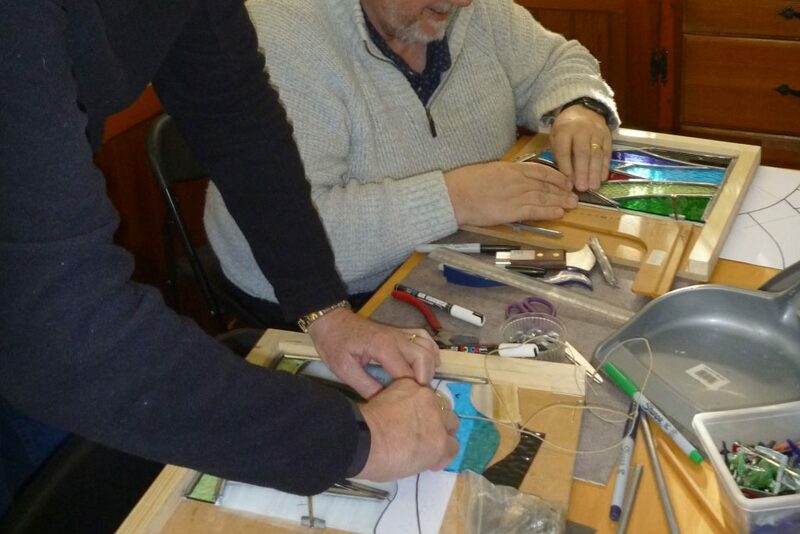 Thus our shortest stained glass course is two days (or six 3 hour weekly sessions). Start by learning to cut glass, discovering which shapes are easy and which are a little trickier. We’ll show you how to create a cartoon (template) for your design, including up to ten pieces & up to A4 in size if you’re with us for a two day course. Choose from our extensive selection of glass and cut & assemble your masterpiece! Build on your previous experience & make a more advanced panel. You might like to make a small window for a door, bathroom cabinet etc. , or something to go in the garden. Again, you have free choice from a wide range of glass. If your panel is to be installed, you’ll have the opportunity to cement it too. 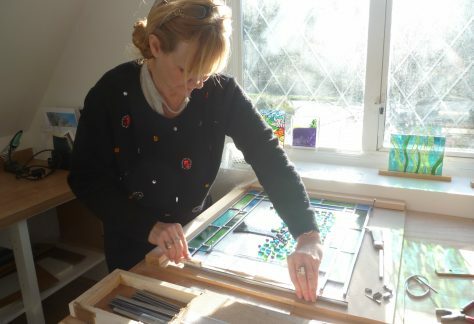 The weekly stained glass courses are ideal if you’d like to make something bigger than A4 & / or with more than 12 pieces. You can make something as simple or as complex as you like & extend your course for as long as you want to. There are no set term times, so you can join whenever there’s a space available. Start by learning (if you haven’t done it before) to cut glass & create a leading cartoon (template). We’ll provide basic materials to get you started. 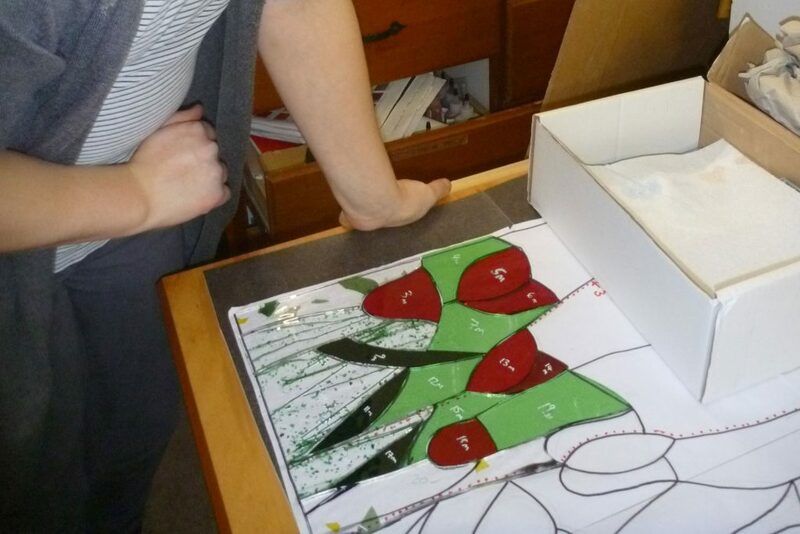 When you’ve created your design, we can give you guidance as to the materials that you’ll need to buy in order to make it. As with the other courses, use of our equipment is included while you’re on site. If you’d like to buy some tools to use at home, we’re happy to give guidance. To book your leaded stained glass class click below and select a date that suits you. If you’d like to know more about the course please check the FAQ page or click below to contact us.